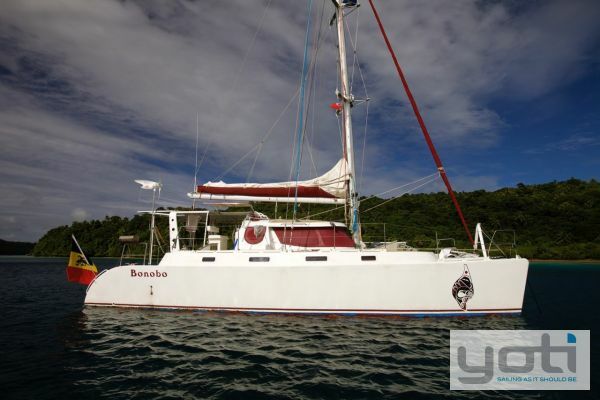 YOTI proudly and exclusively offer for sale the 2009 Prometa - Banana 43 "Bonobo", currently located in the amazing islands of New Caledonia. The Banana 43, build by the Prometa yard in France, is an aluminium "no limits" world cruising catamaran. It has been called the "Landrover" of the Oceans. 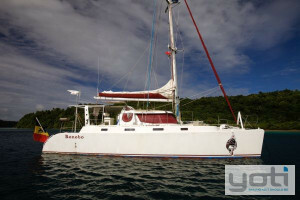 It is a sister ship to "Mowgli", the first version of the Banana. 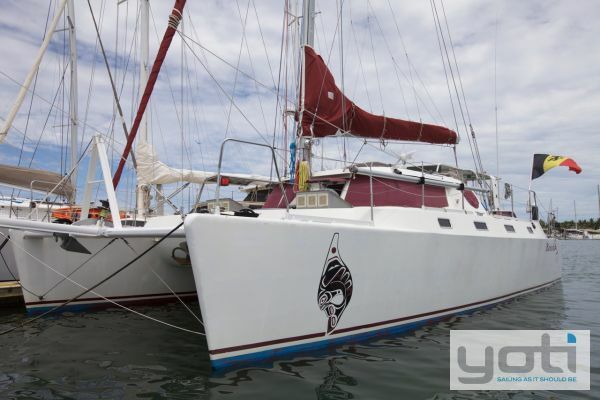 Mowgli sailed half way around the world with the owner's family and he continued with a single hand trip (a world first on a cat) from Australia to Tierre del Fuego! 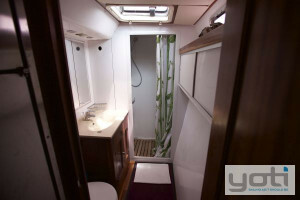 Access to the vessel is made easy by the transom steps, with waterproof hatches to the engine bays and storage lockers. 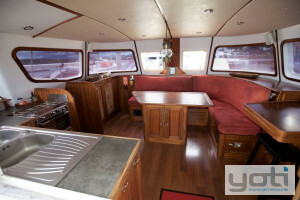 The large cockpit is the focal point for entertainment, with comfortable all round seating and immediate access to helm station with large Furuno plotter and the sail controls. 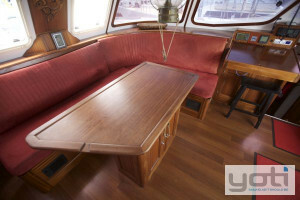 The light and spacious saloon has plenty seating around a solid timber table, has a well appointed galley to port and dedicated navigation table to starboard. Visibly is very good with all round windows, so that you may keep a watchful eye from inside too. The port hull features a double berth cabin up front with plenty storage and overhead hatch for ventilation. In the passage way the beautiful timber joinery continues with more cupboards and domestic size fridge / freezer, for those long passages and cruises. 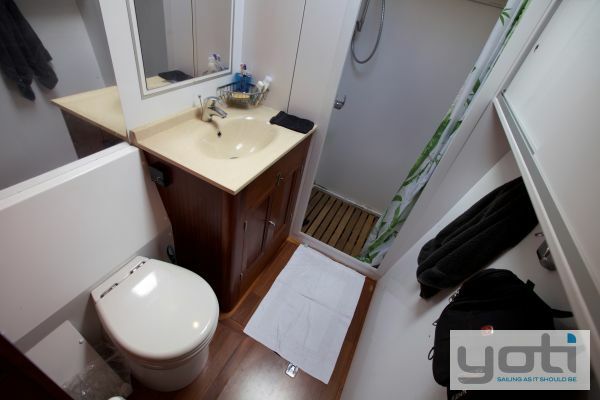 Aft in the port hull is the very large head with enclosed shower that will appeal greatly to those seeking these homely comforts. The starboard hull also has a very comfortable double berth cabin. In the passage way there is a head with washbasin and a separate shower, accessed by its own door. 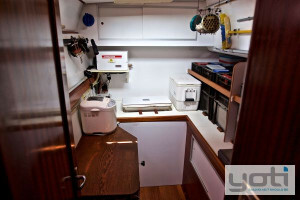 The cruisers dream is found aft in the starboard hull: a dedicated Machinery/ Workshop with amongst others a Sea Recovery 60l/ hr water maker and a freezer. Interestingly all the fridges and freezer are freshwater cooled by means of the onboard vessels water tanks. Efficient, and no marine growth to block the strainers. A single berth could be reinstated in the workshop, in lieu of the bench top. The electrical installation is all Mastervolt; Furuno Navvnet3D navigation and instruments, two independent autopilots etc., precisely what you would expect from an ex Naval Officer, that build this vessel for his extended worldwide cruising. The vessel is self sufficient, with generator, watermaker, solar panels, wind generator, 2 fridges, 2 freezers, gennaker, spinnaker (para sail) and oversized rigging and anchor gear. This is a seriously capable vessel, build to last! 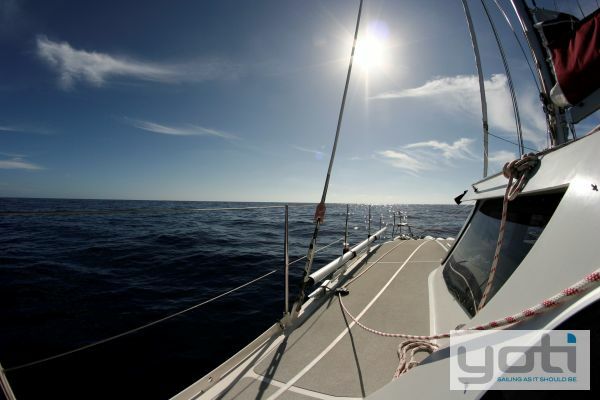 It is a true sailor's boat, even for the extreme latitudes. Contact Robert Vrind of Yoti SE Queensland at 0428 47 22 31 for full details and to arrange an inspection or to discuss this great opportunity. Price in Euros. Price (Ex Tax, Ex New Caledonia). Water (Potable) Capacity (l) : 2 x 300 ltrs ( 600 L in total). 2 Electric Freshwater pumps - Aluminium tank. 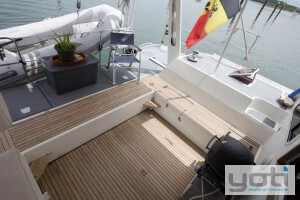 Deck Construction Material : Aluminium with rubber anti slip coating. Engine Hours : Recorded December 2018. Engine Room : Engine - accessed by deck hatch. 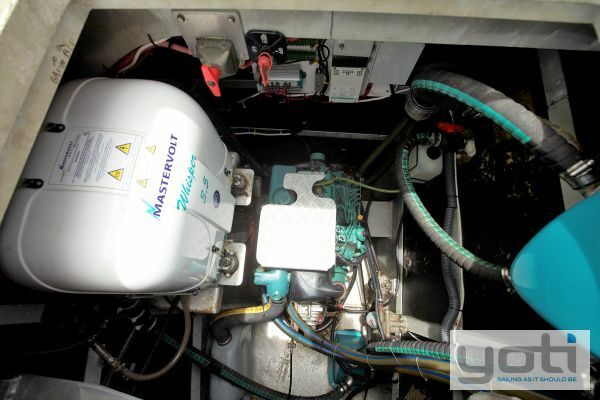 Generator : Mastervolt 3.5 Kw - Needs overhaul. Number of Batteries : Icom IC 604 VHF with DSC. Remote VHF handled at helm. Furuno FA-50 Class B AIS transponder. Fuel Tank Capacity (L) : 400 ltrs each (2 tanks total - 800 ltrs) - Aluminium tank. 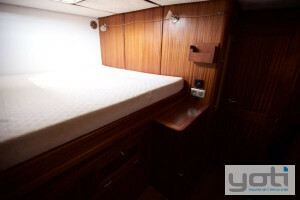 Accomodation Notes : 2 Forward cabins with large double berth. 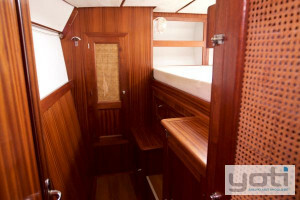 Machinery/ workshop cabin to starboard aft. Shower Type : Port aft: large head with separate shower cubicle. 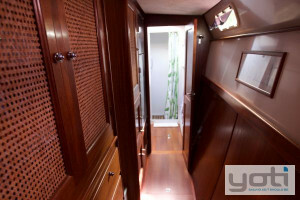 Starboard passage way -head with separate shower. Hot and cold cockpit shower. 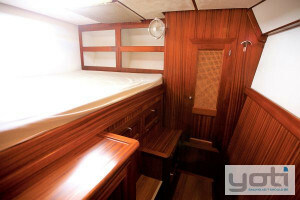 Headroom 1.95 m in saloon, 2.00 m in hulls. Toilet Type : 2 total. 1. 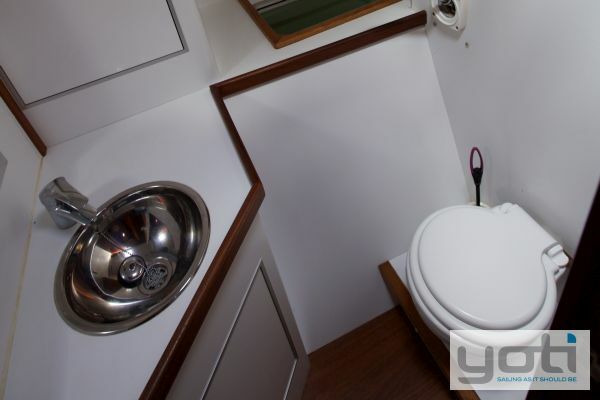 Port aft head: Electric toilet with holding tank. 2. Starboard passage: one manual Lavac toilet. Air Conditioning : Heating installation to cabins. 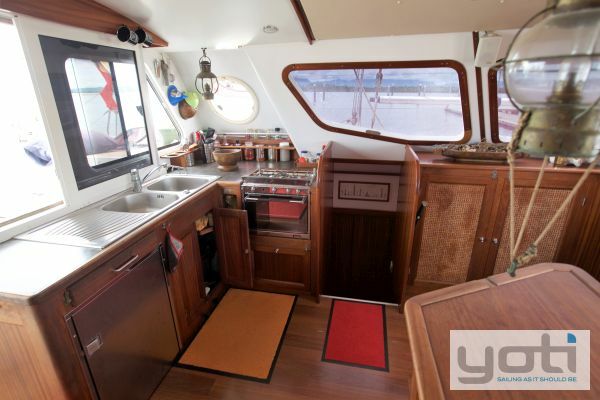 Galley Notes : Appliances -Blender, toaster etc. Fully equipped galley with crockery, cooking pots, etc. Hot water system - Webasto water heater heated by engine coolant or 230V shore power/ generator. Stove : 3 Burner "Techimpex" Gas Stove and Oven. Refrigeration : 12 v Fridges and freezer: One 125 ltrs in galley, one 390 ltr fridge/ freezer in the port hull passage way. 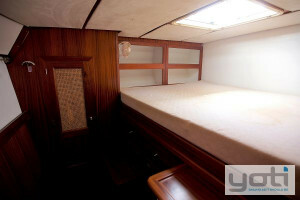 Freezer 230 ltrs in starboard aft Machinery/ workshop cabin. Number of Sinks : Double Stainless steel sinks. Entertainment and Appliances Notes : Alpine FM /AM Radio. Anchor / Winch : Lofran1500 Anchor winch. 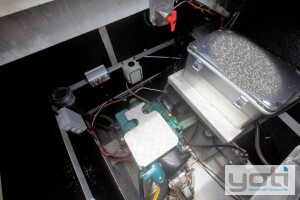 Bilge Pump : 4 x Electric Bilge pumps: One in each central hull and one in each engine bay (auto/manual select). Deck Gear : Aluminium with rubber anti slip coating. 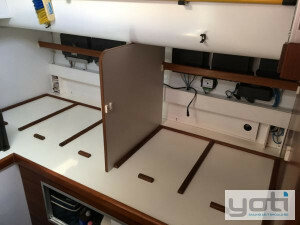 Mast/Rigging : 9/10 Mast, double spreaders sets. Sparcraft - natural anodised Aluminium mast. Aluminium - natural anodised boom. Rod rigging to mast diamonds, 1 x 19 for caps. Sail Inventory : Full batten mainsail with 3 reefs ( 2010) in boom bag with integral lazy jacks. Gennaker genoas ( 2010) on removable Furler. Jib -Genoa ( 2010) on Profurl Furler. Parasail spinnakers with sock. 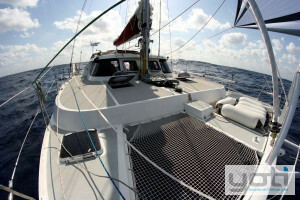 Storm gear -Staysail ( 2010) on removable stay. Genoa and Gennaker on furlers. Spinnaker pole. All Sails by famous French Sailmaker Vega Voiles. Sails in good condition. Electronics Navigation : Furuno sounder/ log. Furuno FI-50 Multi at nav desk and at helm.. 2 x Furuno FI -150 Wind instruments at helm. 2 Furuno autopilots (Lacombe & Smith hydraulics), fully independent of each other with individual helm station controllers. Icom ICM 802 SSB with AT140 Aerial Tuner, Iridium Satellite telephone, Durabook computer with Maxsea and charts. Furuno Radar 24 nm. Dinghy : Caribe 3.1 m ( 2017). Outboard - Yamaha 15Hp ( 2 stroke). Covers : Solid Bimini over cockpit with side shades. 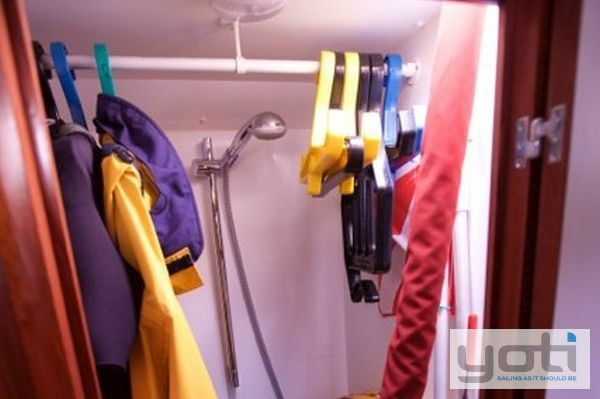 Safety Gear : 5 x Fire extinguishers (serviced Aug 18), Viking 6 man Life raft (2012) service due:'18.6 x Lifejackets. Lifebuoy. Kannad Epirb with GPS ( exp 2018). Additional Small portable Epirb. Ground Tackle : Rocna 35 kg primary anchor with 10 0m of 10 mm Canadian G4 chain. Secondary anchor: Spade with 10 0m warp. Watermaker / De-Sal : Sea Recovery ( 230v) 60 ltrs per hour in starboard aft machinery/workshop cabin. GPS : Furuno GP32. Navnet3D 12" Furuno plotter at the helm. Radio : - Icom IC 604 VHF with DSC. Remote VHF handled at helm. Furuno FA-50 Class B AIS transponder. Remarks : Various spares for pumps, engine and vessel systems. 2 x Swimming ladder. Stainless steel BBQ mounted on pushpit. Portable Webber Gas BBQ. Bauer Dive compressor 330Bar, with 3 steel tanks. The Prometa Banana 43 is a quality build aluminium catamaran, that is comfortable, strong and safe. 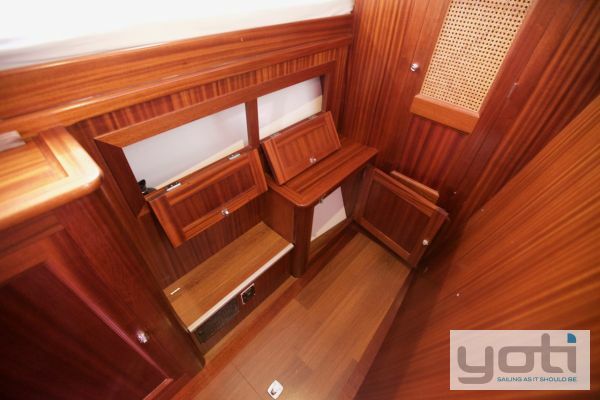 She is fitted out to a high standard and comes fully equipped for world wide cruising. Anti-foul : Last antifouled 2016 - 4 coats. Service History : Engine servicing - Aug 18 - Volvo agent Papeete, Tahiti. Propeller : 3 blade Volvo Penta Folding Prop. 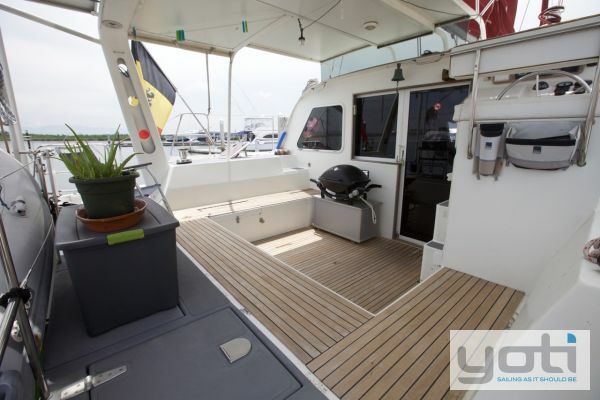 Steering : Hydraulic steering with single wheel offset to starboard. Feel free to call or email us directly.